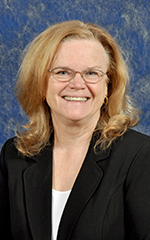 Linda C. Schaffner has been the Associate Dean of Academic Studies since 2011 and Professor of Marine Science since 2006. She graduated with an undergraduate degree in zoology from Drew University and earned both her master's and doctoral degrees in marine science from William & Mary. As a member of the Dean and Director's senior administrative team, Dr. Schaffner provides stewardship for VIMS' education mission, oversees administration of the School of Marine Science graduate program, serves as a contact dean for William & Mary's undergraduate marine science minor, and coordinates VIMS activities in support of the university accreditation process. Dr. Schaffner has been teaching and advising graduate and undergraduate students for over 25 years. Prior to joining the administration, she served as the director of the NSF-funded Research Experience for Undergraduates (REU) program at VIMS, and as the VIMS PI for a program designed to enhance the participation of minority students in ocean science, a collaborative effort with Hampton University and Old Dominion University. She currently provides administrative leadership for VIMS' GK-12 program, which places School of Marine Science graduate students in local middle and high schools where they serve as "scientists in residence." Her achievements in education have been recognized with VIMS' Outstanding Teacher (1994) and Advancement of Women in Marine Science (2004) awards, W&M’s Thomas Jefferson Teaching Award (2001) and Virginia's Outstanding Faculty Award (2003). Dr. Schaffner's research on estuarine ecology and interdisciplinary studies have been supported by NSF, ONR, NOAA, and other federal and state agencies. She has served in an advisory capacity on related issues at state, regional and national levels. From 1997 to 2007 she was a member of the governing board of the Coastal & Estuarine Research Federation and served as the organization's president from 2003-2005. Visit Dr. Schaffner's faculty page.